In service of our mission, we have developed a Yoga for Seniors teacher training program designed to help yoga instructors work safely and effectively with older adults. Held annually since 2007 at Duke Integrative Medicine — part of the Duke University Health System in Durham, North Carolina — this pioneering program combines the best of modern, evidence-based medicine with the ancient wisdom, experience and tradition of Yogic teachings. In this program, Duke medical experts — including physicians, exercise physiologists, physical therapists and health psychologists — cover health conditions common to seniors, such as heart disease, arthritis and osteoporosis. As experienced Yoga Teachers, Kimberly and Carol provide hands-on training in appropriately modifying postures for safe and effective work with older adults. Special issues in teaching older adults are addressed, including pain management, fall prevention and spirituality and aging. Participants will have the opportunity to observe yoga practices modified for seniors participating in various Duke programs including cardiac and pulmonary rehabilitation, and Earn a Certificate of Completion in Integrative Yoga for Seniors from Duke Integrative Medicine. Advancing the art and science of adapting the yoga practice to older bodies, minds, and spirits. 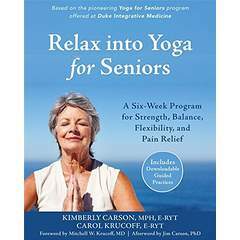 Kimberly and Carol's new book is based on their pioneering Yoga for Seniors program offered at Duke Integrative Medicine. Kimberly and Carol's DVD features safe and effective practices for ease in body and mind.